1. A construction crew (I assume) has decorated a small pine tree in the median of the Merritt Parkway. 2. The buzzing that has been a constant in my head since October subsides finally after Christmas. If something has been forgotten/missed/overlooked/left undone, it’s too late to do anything about it, and that’s such a relief. 3. I received some truly lovely Christmas presents this year, but my most favorite was time with my parents, Gramma, Rudi, and Karen and her family. I never get as much of it as I’d like, so I try really hard to savor that which I’m given. Category: three beautiful things. There is/are Comments Off on median, quiet, and gifts. Merry Christmas everyone! I hope your holidays are full of laughter and light and loved ones. 1. I have forgotten to transfer my cash from one outfit to the next, but don’t realize this until after I place my order. The man at the counter tells me just to give him what I have and calls it close enough. “There’s no reason to get upset about it. Pay me the next time you come in,” he says, even though I have never been in before. But I will be back, Pumpernickels Deli, I will be back. 2. I take my car in to have the blower replaced, since it hasn’t worked since we brought it down to D.C. two years ago. Turns out that a family of mice had made a very weather-proof home once upon a time, and now that the insulation is cleared out of the old blower and the vents, my little car has a defroster — and heat! — again. 3. I paint my fingernails alternatingly red and green. The polish is not quick-dry and so I make a big mess of everything, but the payoff is equally large, as I have cheerful hands and receive compliments from a surprising number of people. Category: three beautiful things. There is/are Comments Off on close enough, mice, and nailpolish. Take a spoonful of the dough and roll it in your hands to make a roughly spherical shape. Roll the cookie in powdered sugar. Voila! Eat or put aside for later. Emmy the Great and Tim Wheeler’s Christmas album, This Is Christmas, has been playing non-stop on my various computers and listening devices since Thanksgiving. I share with you their official video from the cd, but suggest you visit their advent calendar to see the acoustic version, which I might like even better. And, as a bonus for those with a little extra time, I offer you a Christmas memory of mine. 1. The first Christmas cards arrive. 2. A couple wearing Santa hats pedal past me on a bike built for two. 3. A nearly full moon rises over the Eastern Market Christmas tree. Category: three beautiful things. There is/are Comments Off on greetings, tandem elves, and moonrise. 1. Merry Tuba Christmas at the Kennedy Center is filled with 300 deep, innards-rumbling instruments. It makes “Good King Wenceslas” and “Joy to the World” that much more fun to sing along with. 2. Having the Burrow slowly fill up with people for a party and then having it empty back out again. 3. The books I’m reading are bumming me out and I decide I need a change. I grab the copy of A Child’s Christmas in Wales Mum and Dad gave me for my birthday and tuck it in my bag. I pull it out while waiting for the train and start to read — aloud but under my breath — and instantly feel calmer. Somehow, being read to (even if I am the one doing the reading) just feels right. Throw a tree-trimming party: I started this tradition the year after I graduated from college. I was working at a university and had a dozen students working for me. 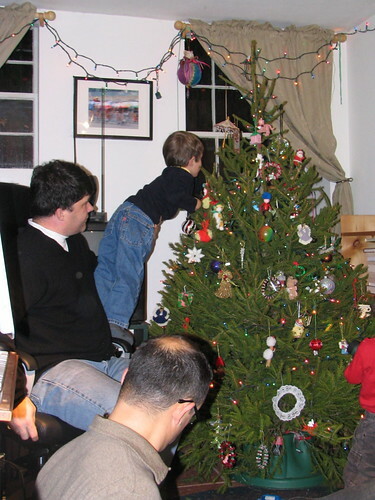 Remembering how sad it was to miss out on decorating for the holidays by the time you got home from school, I invited them to join my friends and me in trimming my tree. I no longer have interns, but I still invite friends over the first Sunday in December to kick off the season in style. Decorate Spritz cookies with Mum: When we were kids this forced labor, but as I’ve gotten older, I’ve come to appreciate a well-adorned cookie — and the less sweet taste of these pressed butter cookies. 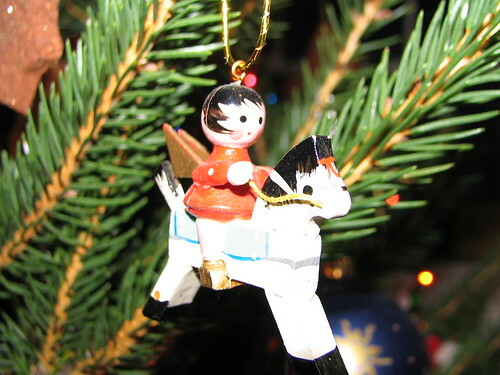 Decorate Gramma’s tree with Dad: At some point my grandfather said he didn’t want a Christmas tree anymore, but my parents over-ruled him and bought one for them, figuring (correctly) that he wouldn’t be able to turn it down once they’d spent their own money on it. I suspect the first couple years Gramma decorated it herself, but as she began to slow down, I’d come over and assist. And then it became Dad and me doing it once it was obvious that her heart wasn’t really in it anymore. Now my parents pick one up before Rudi and I leave after Thanksgiving so Dad and I can get the tree all gussied up before we head home. Make a Christmas cd: Cds are outdated technologies, but it feels nice to be able to hand someone a physical disc rather than pointing them to a url to download a playlist. It’s fun to listen to music to winnow down the contenders (and how I’ll be spending at least part of the coming weekend) and to find the perfect flow. Send Christmas cards: Rudi and I like finding fun and/or pretty cards, and I take seriously the writing of each one. It gives me a few minutes to think about each friend and what they mean to me and to think good thoughts for them. I pull out my red and green pens and stickers and send them to everyone in my address book. This year I’ll be starting at the front of the alphabet after beginning at the end last Christmas. Celebrate St. Nicholas Day: This is a tradition that has come from Rudi’s family, as his dad’s family was Dutch. On Dec. 6, if we’ve been good, we’ll likely find a few treats and a small gift or two in our shoes. Make merry with friends: Many of our D.C.-based friends also throw Christmas parties, and it’s become part of our season to stop in for some munchies at one party and to watch Christmas cartoons at another. Watch holiday specials: We watch cartoons and concerts on tv and movies (and any cartoons we’ve missed on tv or at Sarah and Megan’s party) on video. We’ve got John Denver and the Muppets and The Bishop’s Wife and Frosty Returns (the real one with Mrs. Frosty; not the one they show on tv these days) and Christmas Eve on Sesame Street (which I insist on watching Christmas Eve). And between our collection and Mum and Dad’s, we’re always able to find a new one we haven’t yet seen. Go to a Christmas Eve service with Dad: It’s the one time a year I go to church, but there are candles and carols and a sense of wonder and faith and magic and it feels nice to be a part of that for an hour. Spend Christmas morning with my family: We all curl up in the living room (most of us in our pj’s), with the tree lit up and a fire blazing in the hearth and Christmas music playing on the stereo. We open lovely presents (and hope that the presents we have picked out go over well with their recipients) and snack on sweet breakfasty things and ball up discarded wrapping paper to see who can get the most in a paper bag. It’s fun and relaxed and full of loved ones. Who can ask for more?